Online retailer and auction site eBay has said its income doubled in the second quarter after higher revenue from its PayPal payment business. Income from its e-commerce websites was also higher. eBay reported net income of $692m (£442m) for the three months to the end of June, up from the $283m the company made in the same period a year earlier. Revenue for the business rose by 23% to $3.4bn, slightly above analysts' expectations of $3.36bn. eBay shares rose 5% in after-hours trading following the results, despite forecasting slightly lower-than-expected earnings for the current quarter. 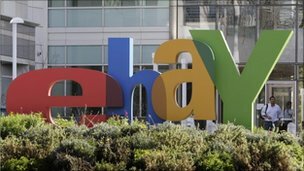 eBay said its marketplaces business, which includes its main auction website, saw the fastest growth since 2006. The marketplaces make money by charging fees to potential sellers listing items for sale. It also generates revenue from transaction fees for users of its online payment system, PayPal, which it is expanding beyond the internet to mobile devices and physical stores. PayPal had 113.2 million active accounts at the end of the second quarter, up 13% from a year ago. Earlier on Wednesday, a blog by an e-commerce software provider highlighted a speech made last month by eBay executive Devin Wenig in which he said the active user base on eBay's online marketplace was growing at more than 10% a year.